Sometimes you have to wonder what the marketing folks at Hamilton were thinking in the late 1950's. For example, the Accumatic line started out with roman numerals denoting the various models and by the early 1960's they adopted the numerical nomenclature of the K-series automatics; where the model had 3 digits and the first digit was the case material and the second digit was a 5 if it had a stainless steel back. It sort of makes you think Hamilton wasn't exactly sure how well the Accumatic line would do initially and then they realized it would do way better than expected. 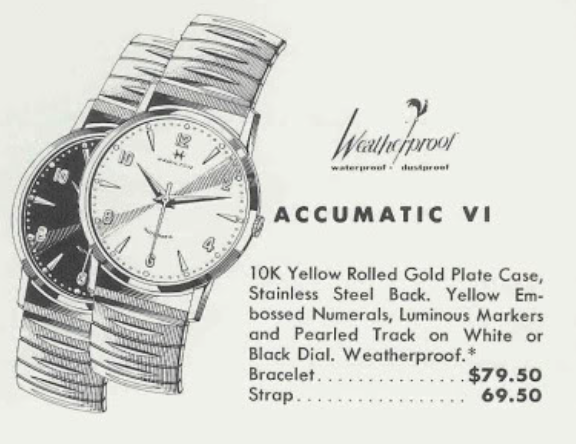 Anyway, one of the earlier Accumatics to get roman numerals was the 1959 Accumatic VI... I suppose that means it was the 6th Accumatic model, although the VII, VIII and IV were introduced the same year. 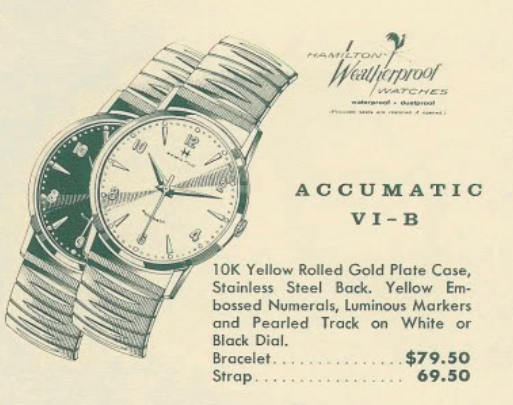 The Accumatic VI was produced for two years and then replaced with the VI-B. When you look at the catalog images there is no obvious differences between the VI and the VI-B. They even came with the same bracelet. Typically a B model will use a different movement and because of the that, it will have a slightly different case. For a good example of this, check out my recent post on the Accumatic VIII from the same year. If the VI and VI-B follow the same suit as the VIII and VIII-B, I would expect the VI-B to have a screw-on case back. Both models have a 10K yellow RGP bezel with a stainless steel back. Hamilton never stressed the grade of automatic movements used in models, other than to occasionally denote the jewel count. So there's no saying definitively what would be inside a VI or a VI-B other than by finding examples in the wild. I was recently sent two examples in need of some love. The first one is a dead ringer for the 1959 Accumatic VI. It's a little dirty but overall looks to be in good shape. The case back snaps on, like the Accumatic VIII from earlier this month. Tucked behind the dial is a 17 jewel 672 movement based on the ETA 1256. I didn't realize until I downloaded my photos that I neglected to take a photo of the movement. Oops. I also have a black dialed Accumatic VI. The hands don't match the catalog images for 1959 through 1961 but they do jive with 1962. Does that mean this is a VI-B? The black dialed watch has the exact same case back as the white dialed version. Again, like a idiot I didn't snap a photo of it - but it's the same snap-on design. However, inside the case is a 17 jewel 689 movement. The 689 was used in 1961, so there's no reason to think that this isn't a proper Accumatic VI-B - but I'm not 100% sure. The first movement is disassembled, cleaned and thoroughly dried. The 672 is a fairly straightforward movement and like most ETA automatics, without it's rotor assembly it looks like your typical manual winding grade. It's now ticking away with good motion. The timer tells me that something inside is making a little extraneous noise. Perhaps there's a piece of lint or dust on the hairspring. There - that's better. After a slight tweak to the regulator there should be no complaints with this performance. Now I can put the oscillating weight back on ... I guess I have a photo to prove there's a 672 in there after all. With the white-dialed version "in the bag", as they say, I can turn my attention to the black-dialed version. It's now thoroughly cleaned and dried. It too look likes a garden variety manual winder without it's rotor assembly. Like it's older brother, it's running with good motion so it's off to the timer. It's running a little slow at 46 seconds per day, the beat rate of 2.2 is higher than it needs to be and the amplitude is just under 200. I like the see the amplitude over 200 but I didn't wind this watch fully yet. Without any additional winding, repositioning the hairspring stud reduced the beat error and a tweak to the regulator brought the beat rate up. This watch is now running just as well as the other one. The white-dialed Accumatic VI gets to enjoy some time on an original bracelet. Looks pretty sharp, if I do say so myself. A nice black genuine lizard strap complements the black-dialed version nicely. Black dialed watches are always tricky to photograph, especially when there are a lot of reflections involved. Here's another shot from a different angle. You can see why black-dialed models are always popular - they're very striking while on the wrist.